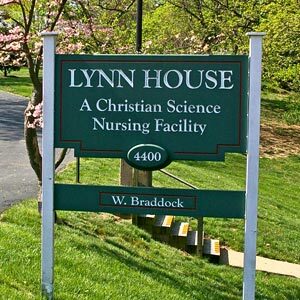 Lynn House is a haven for those relying on God for healing — a place to pray and commune with God, and be cared for by Christian Science nurses. Located in historic Alexandria, VA, Lynn House is a home away from home. Our grounds are a lovely mix of flowering trees, lawns, gardens, and patios. The rooms are delightfully furnished and include free Wi-Fi. Meals are varied and delicious. Our services include: Christian Science Nursing Care (inpatient and outpatient); Rest and Study; The Residences, a residential/sheltered and assisted living program; and a flexible Visiting Christian Science Nurse Service for care in the home. We also offer training and workshops to become a Christian Science nurse or to learn more about it. We are open 365 days of the year, and you are welcome to call at any time. Our region includes, but is not limited to Virginia, Maryland, District of Columbia, Delaware, West Virginia, North Carolina, and parts of Pennsylvania. Winter 2018-2019 newsletter. Click here to read it. Christie C. Hanzlik, C.S., from Boulder, Colorado, gave an inspirational talk about "a way to pray" at Lynn House in October 2018. Click here to view the video or here to read it. Our Director of Outreach and Advancement position is open. See all full- and part-time open positions at our jobs page.